ATHENS, Greece -- Greece slipped deeper into its financial abyss after the bailout program it has relied on for five years expired at midnight Tuesday and the country failed to repay a loan due to the International Monetary Fund. With its failure to repay the roughly 1.6 billion euros ($1.8 billion) to the IMF, Greece became the first developed country to fall into arrears on payments to the fund. The last country to do so was Zimbabwe in 2001. After Greece made a last-ditch effort to extend its bailout, eurozone finance ministers decided in a teleconference late Tuesday that there was no way they could reach a deal before the deadline. "It would be crazy to extend the program," said Dutch Finance Minister Jeroen Dijsselbleom, who heads the eurozone finance ministers' body known as the eurogroup. "So that cannot happen and will not happen." "The program expires tonight," Dijsselbleom said. The brinkmanship that has characterized Greece's bailout negotiations with its European creditors and the IMF rose several notches over the weekend, when Prime Minister Alexis Tsipras announced he would put a deal proposal by creditors to a referendum on Sunday and urged a "No" vote. The move increased fears the country could soon fall out of the euro currency bloc and Greeks rushed to pull money out of ATMs, leading the government to shutter its banks and impose restrictions on banking transactions on Monday for at least a week. But in a surprise move Tuesday night, Deputy Prime Minister Yannis Dragasakis hinted that the government might be open to calling off the popular vote, saying it was a political decision. The government decided on the referendum, he said on state television, "and it can make a decision on something else." It was unclear, however, how that would be possible legally as Parliament has already voted for it to go ahead. Greece's international bailout expires at midnight central European time, after which the country loses access to billions of euros in funds. At the same time, Greece has said it will not be able to make a payment of 1.6 billion euros ($1.8 billion) to the IMF. 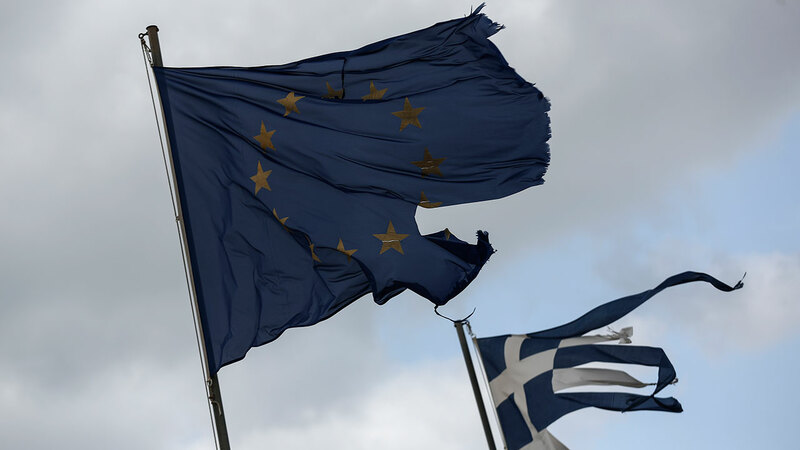 With its economy teetering on the brink, Greece suffered its second sovereign downgrade in as many days when the Fitch ratings agency lowered it further into junk status, to just one notch above the level where it considers default inevitable. The agency said the breakdown of negotiations "has significantly increased the risk that Greece will not be able to honor its debt obligations in the coming months, including bonds held by the private sector." Fitch said it now considered a default on privately-held debt "probable." Hopes for an 11th-hour deal were raised when the Greek side announced it had submitted a new proposal Tuesday afternoon, and the eurozone's 19 finance ministers held a teleconference to discuss it. But those hopes were quickly dashed. German Chancellor Angela Merkel said she ruled out further negotiations with Greece before Sunday's popular vote on whether to accept creditors' demands for budget reforms. "Before the planned referendum is carried out, we will not negotiate over anything new," the dpa news agency quoted Merkel as saying. Greece's latest offer involves a proposal to tap Europe's bailout fund - the so-called European Stability Mechanism, a pot of money set up after Greece's rescue programs to help countries in need. Tsipras' office said the proposal was "for the full coverage of (Greece's) financing needs with the simultaneous restructuring of the debt." Dijsselbloem said the finance ministers would "study that request as we should" and that they would hold another conference call Wednesday, as they had also received a second letter from Athens that they had not had time to read. Dragasakis said the new letter "narrows the differences further." "We are making an additional effort. There are six points where this effort can be made. I don't want to get into specifics. But it includes pensions and labor issues," he said. European officials and Greek opposition parties have been adamant that a "No" vote on Sunday will mean Greece will leave the euro and possibly even the EU. The government says this is scaremongering, and that a rejection of creditor demands will mean the country is in a better negotiating position. In Athens, more than 10,000 "Yes" vote supporters gathered outside parliament despite a thunderstorm, chanting "Europe! Europe!" Most huddled under umbrellas, including Athens resident Sofia Matthaiou. "I don't know if we'll get a deal. But we have to press them to see reason," she said, referring to the government. "The creditors need to water down their positions, too." The protest came a day after thousands of government supporters advocating a "No" vote held a similar demonstration. On Monday, European Commission President Jean-Claude Juncker made a new offer to Greece. Under that proposal, Tsipras would need to accept the creditors' proposal that was on the table last weekend. He would also have to change his position on Sunday's referendum. Commission spokesman Margaritis Schinas said the offer would also involve unspecified discussions on Athens's massive debt load of over 300 billion euros, or around 180 percent of GDP. The Greek side has long called for debt relief, saying its mountainous debt is unsustainable. A Greek government official said Tsipras had spoken earlier in the day with Juncker, European Central Bank chief Mario Draghi and European Parliament president Martin Schulz. Meanwhile, missing the IMF payment will cut Greece off from new loans from the organization. And with its bailout program expiring, Greece will lose access to more than 16 billion euros ($18 billion) in financial support it has not yet tapped, officials said. They spoke on condition of anonymity because talks about the program were still ongoing. On the streets of Athens, long lines formed again at ATM machines as Greeks struggled with the new restrictions on banking transactions. Under credit controls imposed Monday, Greeks are now limited to ATM withdrawals of 60 euros ($67) a day and cannot send money abroad or make international payments without special permission. The elderly have been hit particularly hard, with tens of thousands of pensions unpaid as of Tuesday afternoon. Many also found themselves completely cut off from any cash as they do not have bank cards. The finance ministry said it would open about 1,000 bank branches across the country for three days beginning Wednesday to allow pensioners without bank cards to make withdrawals. But the limit would be set at 120 euros for the whole week.